Vibrating spiral elevators are designed to elevate a variety of bulk solids without spilling or jamming parts. Available in diameters up to 11 feet and heights up to 60 feet. Process capability for drying or cooling the product while elevating. High temperature designs available for handling materials up to 1500 deg. F.
Available in brute force or natural frequency design. Adjustable stroke and angle of attack for retention time control. Water or steam-jacketed trough designs available. Product contact surfaces can be Plasma or Teflon coated for handling of sticky product. U.S.D.A. (3A) food and dairy grade clean up available. 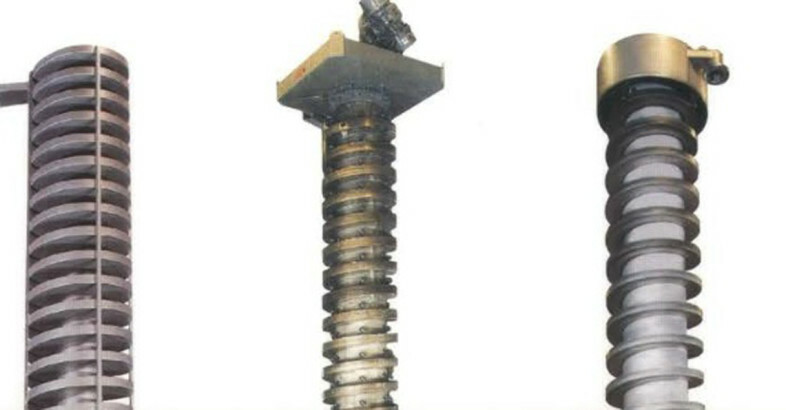 Choice of spiral elevator construction materials: metal alloys or stainless steel. 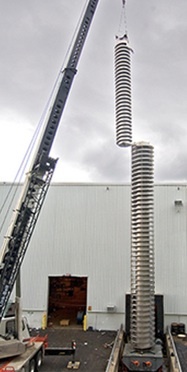 The photo illustrates a 52 ft. tall DDSP spiral designed to elevate and cool product. The upper TMSP spiral elevates product an additional 27 ft.